“Tomorrowland” is one of the absolute most complex episodes Mad Men ever gave us, as Don is accompanied by Megan on a trip to California with his kids, hastily proposes to her, and leaves the viewer confused as to whether or not he did the right thing. Years later, and after many subsequent viewing, I am still not sure – because while I can pick apart the ‘logic’ (or lack thereof) behind Don’s decision, or even factor in the gift of hindsight, what makes “Tomorrowland” so stunning, involving, and ethereal is how intensely human Don’s decision feels. And that makes his choice impossible to judge. For Don, Season 4 is about picking up the pieces of the old life he shattered, and trying to find a new path towards sustainable happiness. For half the season, he drinks himself into oblivion, and after the turning point of “The Suitcase,” he makes a conscious effort to start changing things. He wants to be a better man so badly that it hurts – and that is precisely the problem. Change isn’t easy. Sustained happiness is difficult to come by. Don searches for it knowing the road will be long and painful. But then, in “Tomorrowland,” he takes a detour, and experiences a week of pure bliss with his children and this new, seemingly wonderful woman in his favorite place on earth. He takes the best vacation of his life, feels the kind of happiness he knows he wants to have, and makes the decision that he thinks will make that sensation permanent. In proposing to Megan, he is attempting to bring the fantasy back home with him – and the brilliance of “Tomorrowland” is that it is tough to blame him. The episode is so carefully, artfully directed, the romantic atmosphere of Don’s vacation so infectious and all-consuming, that when Don makes the choice to propose, something about it feels instinctually right, even if we know it is intellectually misguided. “Tomorrowland” is the story of a man who goes on a vacation and tries to turn it into his life. Who cannot relate to that desire? 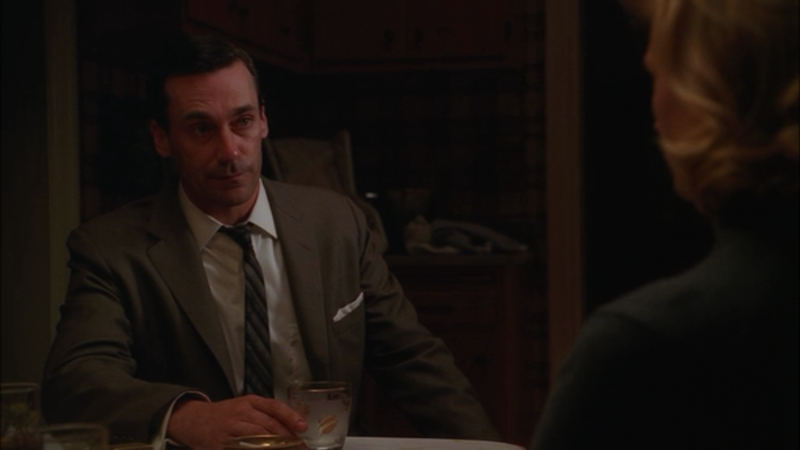 The problem, of course, lies in the difference between depths and surfaces, as it always does on Mad Men. Don believes he loves Megan based on this small series of interactions he had with her in California; he loves her for the fantasy she represents, not for the person who is, for the most part, still a stranger to him. But surfaces are easy. Surfaces can be whatever we want them to be. And ultimately, Don makes the very human mistake of choosing the easy satisfaction of a gratifying surface, rather than continue on his journey to reshape his own wounded depths. In a time of great confusion, he latches on to the clearest source of happiness he can find – and if that is not a universally identifiable human failing, I don’t know what is. If anything, I find “Tomorrowland” even more impressive now, with the show’s run concluded, and knowing that, as the title implies, it essentially presages the entire back half of the series. Don chooses a future in which he shall continue to chase happy surfaces, rather than confront the pain that festers in his heart. The dark and introspective spirals the show would begin arcing from this point forward find their origin in this episode, and watching it now is proof of how carefully, thoughtfully arced Mad Men was as a whole, throughout its entire run. It is also, simply put, one of the richest and most evocative hours the series ever delivered. 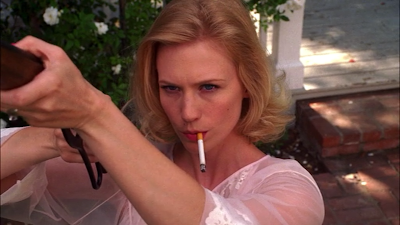 The quintessential Betty Draper episode, “Shoot” ends with one of the most iconic images in the history of the series – Betty, in her nightgown, cigarette dangling from her mouth, shooting at pigeons with a BB gun – and along the way, tells one of the most powerful and elegantly woven stories about agency and ambition in the show’s history. The hour comes at the height of Betty’s Season 1 existential crisis. The ‘endpoint,’ for a woman of her era, was to be married, to have kids, to have the nice home…but then what? At the episode’s start, Betty looks at those pigeons flying overhead and feels a pang of sadness, longing to be ‘free’ like them, and realizes how the ‘social map’ has not brought her happiness. As a means of escape and expression, Betty decides to go back to modeling, the one real job she had outside this domestic life, and she absolutely shines doing it, looking happier and more fulfilled than at any point up to now. This is just one of those terrific Betty episodes one watches now, and then remembers whenever one is tempted to ‘judge’ her in later seasons – because the crap she deals with this season, given just how terrible Don is to her, and just how trapped she feels in this domestic nightmare fantasy, is painfully palpable, especially in an episode like “Shoot.” What makes the relationship between her and Don especially interesting, in this hour, is that Don is outwardly supportive of her at every turn. His greatest cruelty comes, as it often does, from actions he takes while away from her. Don’s parallel story in “Shoot” involves him being courted by Jim Hobart – whose presence casts a specter of sad inevitability over this episode now, as Don and the rest of characters would eventually be swallowed up by McCann – and leveraging his offer for a big raise at Sterling Cooper. But refusing McCann, as Hobart makes clear, means Betty will lose the modeling job she has procured there. That Don does not hesitate to refuse him, or even have an adult conversation with Betty about how Hobart manipulated them, is one of his more quietly monstrous actions from this first season. January Jones is just stunningly effective in this episode, mesmerizingly conveying the distance between her calm, composed surface and raging, confused interior, and that final image is, again, one of the most powerful the show would ever conceive. At the start of the hour, Betty wants to be like those birds. At the end, with yet another avenue of personal expression closed off to her, feeling doomed to live this unfulfilling domestic life forever, she wants to shoot those birds out of the sky – to do to them the horrible thing that has been done to her. 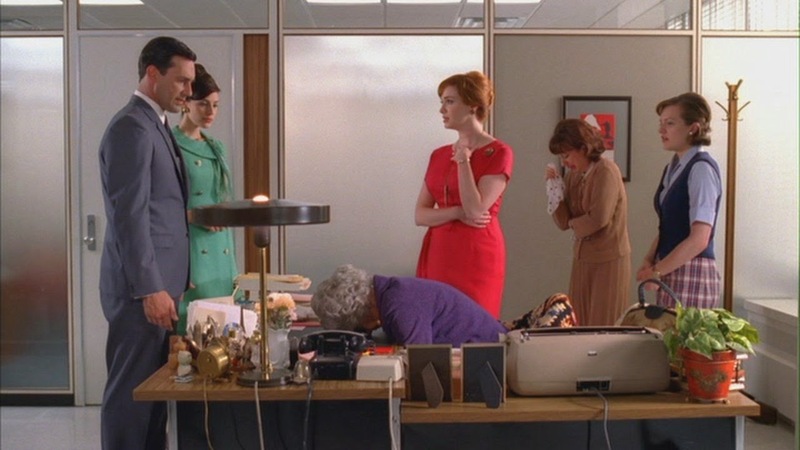 I don’t know if I would call “Red in the Face” the first ‘great’ episode of Mad Men, but it is the earliest installment on this list, and I think it could be the best early example of how this show could tell a great short story, and let it spin around several characters all at once. The spine of the hour is Don quietly seething at Roger for coming on to Betty when Roger visits their house for dinner, and planning a rather brilliant revenge in which Roger – after consuming copious amounts of oysters, alcohol, and cheesecake at lunch, and then taking the stairs up to the office after Don pays the elevator operator to pretend the elevator is out – vomits during a meeting with the Nixon camp. It is such a wonderfully playful little story, creative and compelling and beautifully constructed, and one which has always stuck in my mind as particularly memorable. It’s creepy, disturbing, and also a rather perfect expression of the pure ‘id’ behind the destructive masculine ego Mad Men explores. I rarely see “Red in the Face” mentioned in discussions of the best Mad Men hours, but it is such a rich and multifaceted episode, and such a tremendous early expression of the show’s overall mission statement, that it has long stood as one of my favorite installments in the life of the series. 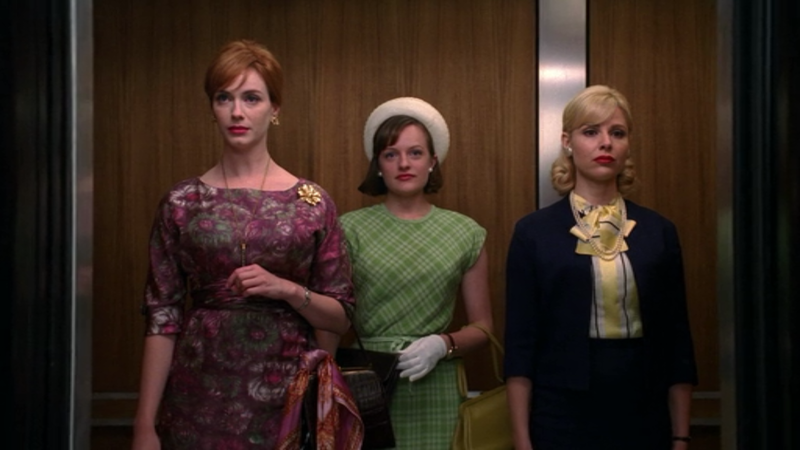 As a great episode for Peggy, Joan, Sally, Megan, and especially the ‘astronaut’ Ida Blankenship, “The Beautiful Girls” is more or less automatically one of the all-time great hours of Mad Men, among the best single-episode showcases for the series’ tremendous female cast. It is also one of the best examples of how seamlessly Mad Men could interweave comedy and drama, always in service of more powerful and complex emotions. Miss Blankenship’s untimely death is, of course, the most obvious showcase for this, a sequence of beautifully organized chaos with so many moving pieces: clients in the boardroom, Sally in Don’s office, Miss Blankenship keeled over at Don’s desk, and Don trying to keep the clients distracted while Joan, the secretaries, and Pete (in a great background detail) try to remove Miss Blankenship’s corpse. 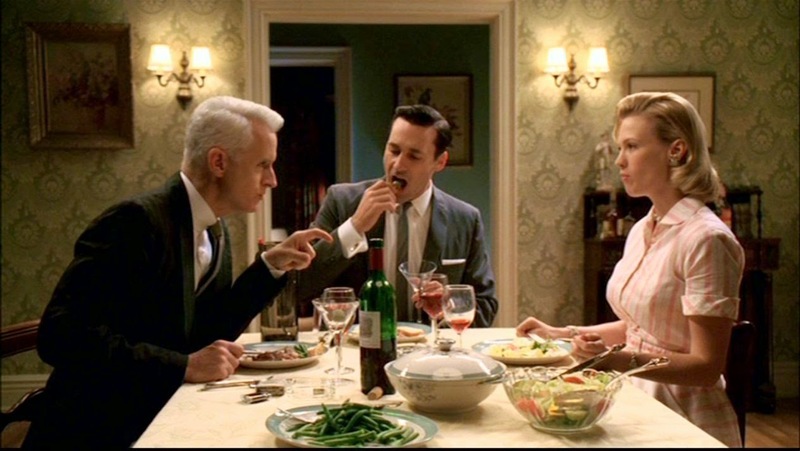 It is screamingly funny, one of the best sustained comic set-pieces this side of “Guy Walks into an Advertising Agency,” and yet it also leads to some genuine existential reflection from Roger, Joan, and especially Cooper, whose “astronaut” quote has since become one of the defining, iconic lines from the run of the series. Mad Men doesn’t get enough credit for it, but one of its greatest strengths was the ability to mix the profound with the silly, and with the death of Miss Blankenship, it found one of the best outlets for this particular talent. While Sally is initially used as a small piece in this larger comic symphony – Peggy telling Sally “Do not come out of there,” and Sally shouting back “I KNOW!” is just terrific – she quickly becomes the heart of the episode, in what was probably the first great showcase for Sally as a full-fledged character. Kiernan Shipka had always been effective, but as a young child, she was more often there as an extension of Don or Betty stories; this season, though, Shipka and Sally really started coming into their own, and this is just a wonderful story for her. The meltdown at the episode’s climax is her most outwardly memorable moment, but my favorite scenes are when Don takes her back to his apartment, tries to be stern with her, and ultimately softens, while Sally has a great time being with her dad (Sally accidentally making French Toast with rum instead of syrup, and Don thinking it’s actually pretty good that way, is a terrific little scene). Joan’s story, meanwhile, leads to the conception of son Kevin – with Roger in the aftermath of a mugging – while Peggy meets future boyfriend Abe, who is so obviously a heel, and yet brings out many great, funny notes from Elisabeth Moss. “The Beautiful Girls” is among the most entertaining and poignant episodes Mad Men ever delivered, multifaceted but also expertly focused, and a shining example of just how much rich drama and comedy the series could pack into a single hour. In “The Gypsy and the Hobo,” three seasons worth of watching Don Draper lie to his wife and run from his past comes to a head, and the result is perhaps the most unbearably tense and wrenchingly emotional extended sequence the series ever crafted. The set-up for Don and Betty’s confrontation is ingenious. Betty has learned at least a part of Don’s secret, knowing that he had another wife and another name, and has come home early from a visit to her family to confront him. Don, meanwhile, believes his family is out of town, and plans a romantic getaway with his current affair, Suzanne (the kids’ elementary school teacher). He leaves her in the car to run into the house and grab some things, and as soon as he runs into Betty, a dramatic reckoning begins – with the possibility of Suzanne coming in and making the entire situation implode hanging over everything. The following 20 minutes or so are positively electric. As Betty tells Don what she knows, and Don finally makes the choice to come clean, we watch the careful visage constructed by Don Draper melt away. His face becomes gaunt, thin, cowardly, and foreign – all through the power of Jon Hamm’s remarkable, transformative performance. As the many sides of Don Draper’s split identity come together, in front of the woman he hoped would never see him this way, Hamm delivers his most powerful and astonishing performance from the life of this series. And when you are talking about what is consistently one of the all-time greatest performances ever given on American dramatic TV, that throws “The Gypsy and the Hobo” into the uppermost echelon of quality. Of course, Hamm could not achieve this sequence without January Jones as his duet partner, and studying Betty’s reaction to all of this – her anger giving way to a confused sense of sympathy – is equally fascinating. One of the things I love most about the show’s first three seasons is that Don and Betty have a chemistry that is so palpable and compelling, and this episode is the climax of their relationship, the moment when she finally sees the broken, wounded man she has married for what he really is. And while leaving Suzanne in the car creates an undeniable sense of tension – no matter how many times I see this episode, and no matter how fully I know she never walks in – her off-screen presence is more important in serving as a constant reminder that Don does not have the moral high-ground in this confrontation. We may feel bad for him, like Betty does, to see just how deep his pain runs, but when that pain is manifested in lying and cheating – his greatest moment of ‘honesty’ coming with his latest affair just a few dozen yards away – Don Draper is never let off the hook for his sins. Outside of the climax, “The Gypsy and the Hobo” has plenty of other great material. There is a subplot with Peggy and the other copywriters having to brainstorm a way to rebrand a controversial dog food made from horse meat – leading to the wonderful Peggy-ism “Dogs don’t like uniforms” – a nice little story about Roger encountering an old flame (with copious references to Casablanca), and Joan hitting Greg over the head with a vase of flowers. That alone might put this episode in the Top 20. But for that final sequence, and its immense significance in the life of the series, “The Gypsy and the Hobo” will always be one of the very best episodes Mad Men ever gave us, and certainly one of the most emotionally impactful. Come back tomorrow as our journey through Mad Men's greatest hits concludes, with #5 - #1 on the countdown, and on Friday for one final retrospective piece.